Yamagata Film Criticism Workshop 1 – DOCU-YAMA LIVE! The boy nestles deeper inside the enamel bathtub. “Don’t use too much water!” A rap on the door and an argument brewing in the next room. The camera’s shallow depth of field holds him close. He is at home and on edge. We keep him company. Two films in the International Competition at the 2017 Yamagata International Documentary Film Festival, made by young women directors from China and Poland, share more than first meets the eye. Another Year (directed by Shengze Zhu) and Communion (directed by Anna Zamecka) frame relative degrees of improvisation within tight spatial and temporal parameters. This visual style emphasizes the idea of encounter—between subject, filmmaker and audience—through a simultaneous exhibition of spontaneity and formality. The filmmakers foreground their own ways of looking as an acknowledgement of their complex subjects, and how they regard them. Both films portray low-income families: one shuttling between Wuhan and the countryside, and the other living an hour from Warsaw. Living rooms are where we spend most time with the families. These rooms are claustrophobic, shot by Zhu in static tableaux, and in Zamecka’s film, through a fixed lens at close range. The rooms are filled with television chatter and steam from cooking; they are grubby, cramped and lived in—it seems as if they themselves are living. Wallpaper has darkened into blotches in Warsaw, and children’s scribbles pockmark the walls in Wuhan. These domestic spaces are both walled from the outside world, and vulnerable to it. Another Year chronicles thirteen meals shared between three children, their parents and grandmother over the course of a year. Zhu taught photography in her native Wuhan after returning from art school in the U.S. One of her students was Qin, the teenage girl at the center of Another Year. Visiting Qin and her family each month, Zhu would position her camera in a different corner of the living room and observe meals and conversations in real time. 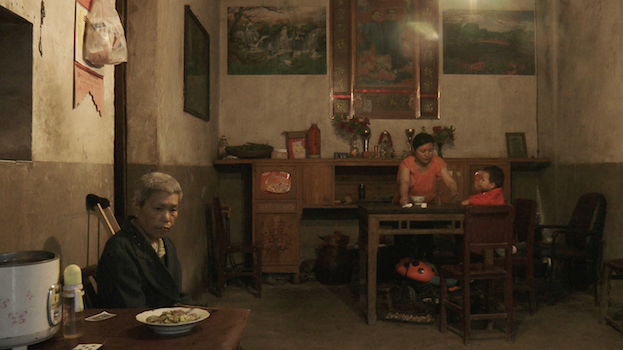 Over the course of the film’s three hours, we learn that Qin’s family work in the city but, like many migrants from the countryside, cannot register for welfare or healthcare there. Each section is demarcated by fades to black, and the month written in Chinese and English. Nights grow darker and people keep their coats on. Between January and February, the grandmother has a stroke. Some months, we find ourselves in the rural house whose doors are open to neighbors and chickens. One time the dumplings are too salty, and another, stuffed too full. Qin has to leave school to earn money for her family. Fireworks crack beyond the steamed-up window as another year begins. Communion, Zamecka’s first film, won the top prize at Yamagata. Like Another Year, it portrays a girl at home with her family. Zamecka took an interest in the family after meeting the father by chance at a train station. Perhaps thanks to her background in anthropology, she became close to the family and spent a year with them before filming. She related to the daughter, Ola, whose responsibilities exceeded her years. Communion’s script is based on what Zamecka saw that year: the mother was largely absent, the father was increasingly alcoholic, and Ola prepared her autistic brother, Nikodem, for his Holy Communion. As the film’s title suggests, caring for her father and brother single-handedly, Ola tried to hold her family together. Communion’s script gives it a narrative tightness mirrored by fluent camerawork and cutting reminiscent of fiction film (Zamecka used a well-known Polish cinematographer and editor). Playing themselves, the family ignore the camera as actors would, and depart from the script as if they had none. Nikodem takes refuge from family arguments in the bathtub, where he talks to himself. When he mutters “reality becomes fiction,” a line Zamecka insists was not in the script, he expresses the film’s blurring of improvisation and staging. Zamecka closes Communion as she opens it, with Nikodem dressing himself and Ola helping him pack his school books. As in the way Zhu’s film ends as another year begins, Communion creates narrative closure alongside a sense of incompleteness: it’s another morning, and life goes on. Another Year is a chamber piece of two living rooms, a family that moves between them, and a discreet period of time. Given thirteen steady and lingering looks, the rooms and their occupants speak indirectly of China’s rapid industrialization, intergenerational cohabitation (and its tensions), and an inadequate social welfare system. They also speak of familiarity—ordinary familiarity and intimate familiarity. As if sitting in the corner of the room, we watch each meal and become part of the furniture; Zhu’s camera is barely remarked by the family. While we never see Zhu, her presence is palpable in her frames and cuts. This simultaneous inscription and effacement of her presence is appropriate given that she is both local and an outsider, geographically close and socio-economically removed. While the act of observing the family is one-directional, Zhu’s authorship is an acknowledgement of her particular way of looking. She reminds us that no act of seeing is unmediated. Another Year’s third section of is a feat of symmetry and timing. We face a table at which Qin and her father sit. They look beyond us to a television. The wall behind them is mottled from backs and heads that have leant on it. Qin and her father share cartons of rice and fried eggplant that she has bought “downstairs.” We seem to be on an upper floor, perhaps surrounded by similar families sharing cramped quarters and steamed rice. On the wall above the father hangs a calendar, and above Qin, a clock. It’s March, and it’s twenty past eight in the evening. Between these temporal markers is another: a family photograph. The next section will be a close-up of this photograph, its glossy surface reflecting the television opposite. The photograph and the television, the clock and the calendar: four discreet markers of time, positioned in a quadrant. Qin offers her father more rice. You’ve bought too much, he tells her. The conversation turns to the youngest son’s cradle, which he has outgrown. Qin asks for new shoes. Alicia Keys sings on the television: I keep on fallin’ in and out of love with you… The conversation trails off as the song distracts them. I, I, I, I’m fallin’… The section fades to black and March falls into April. A room is framed by walls, and Zhu’s static, perpendicular shots provide a frame within a frame. Each shot lasts over ten minutes and, without intercuts or zoom, there is time and space for looking. Zhu’s precise framing also draws our attention to what is beyond the frame, or missing. The camera that doesn’t move contrasts the family that has to move. Another Year opens with the sound of Qin’s youngest sibling in an adjacent room, crying for the father who is still out at work. A plaintive off-screen voice, an absent parent, trains outside, and phone-calls between Wuhan and the countryside: these are signals for the family’s displacement. The cut is a defining feature of Another Year, sometimes occurring abruptly and, other times, feeling delayed. Each section of the film begins in medias res and feels incomplete because there are no definitive stage-exits. Conversation topics recur (income, the grandmother’s health, smelly chopsticks), and meals extend into leftovers. Such incompleteness is not only realistic to everyday life but also emphasizes the impossibility of rest or certainty for poor migrant workers. Life goes on, and their marginalization continues. We cannot know what happens after the camera stops rolling or beyond its frame of vision—such editorial decisions are Zhu’s alone. In turn, Zhu only films what the family chooses to show her. In these negotiations between improvisation and planning, subject and filmmaker, Another Year is similar to Communion. Failing his first examination for Holy Communion was a disappointment for Nikodem; Zamecka decided to restage the communion as a rite of passage for him. It also provides a metaphor for the social (and in particular, Catholic) institutions that Ola and Nikodem navigate—largely unaided. No one in the community addresses Nikodem’s autism, and indeed, the word “autism” is not mentioned in the film. In this sense, Nikodem is a child braving unacknowledged obstacles, just as his sister shoulders adult responsibilities. “Communion” suggests community, but the film complicates ideas of inclusion and care. Dress and the act of dressing oneself are important in Communion, which opens as Nikodem struggles to fasten his belt. He sits on his bed, panicking with the buckle. Faded damask wallpaper flattens his figure into the background. Later in the film, Ola fights tears and the zip of her dress, which is stuck. She is dressing for Nikodem’s communion, which her separated parents will both attend. Zamecka cuts from Ola to fuzzy home video footage of Ola’s mother, dressing for her own communion in the late 1980s. The child twists her skinny arms to fasten the back of her dress. Her own mother walks into the room to fetch something, but does not help. The scenes of Nikodem, Ola and their mother each show an act of dressing at home in preparation for going out. Watching feels intimate because the children seem so vulnerable in their imposed independence. Like the walls of their homes, their clothes are both fortifying and restrictive. Another indication of Ola’s lack of support plays out in a conversation with a visiting welfare officer. The camera fixes on Ola as she deflects the officer’s questions and evades eye contact. The cutting is urgent to reflect her discomfort. Like Nikodem when he was filmed dressing against a wall, Ola seems trapped. There is little space for escape between the closed kitchen door, the officer and the camera. “My behavior could be better,” she says. The officer asks her father if he’s been drinking. The camera hovers on Ola, who draws lines in the condensation on the glass door. “Do you want me to report this?” There is no need for a reverse shot: Ola’s silent restlessness says everything. Communion and Another Year portray marginalized, unstable and vulnerable individuals: in this sense, their subjects are socio-economic outsiders. Yet both films chronicle intimacy and cooperation. They access worlds in which familial references, idiolects, eating habits and memories are central. It is we who are outsiders, invited in. Nikodem is held safe by the bathtub while his world threatens to fall apart; the close framing places us in this haven with him. As cramped as Qin’s Wuhan apartment is, it is her home—and becomes familiar to us as we share meals there. A sense of responsibility grows as we spend time with each family: how are we looking at them? What feels strange? What becomes familiar? What is beautiful? What is unjust? Zhu and Zamecka’s careful narrative and visual frames give subjects space to be seen and heard, they emphasize their directors’ perspectives, and they criticize films that use rough aesthetics as a shorthand for poverty. Shared meals and a communion are analogues for interactions between subject, filmmaker and audience. The auditorium at Yamagata becomes an extension of the living room: the films are emplaced encounters, expansions of a look. Zhu and Zamecka remind us that we are all enmeshed in systems that industrialize, individualize, and make some lives nearly invisible. Nearly invisible. Their films invite us into alternative systems of representation: ones which regard subjects with regard, and frame them for support.